A passerby jumped into action and tried to save a motorcyclist's life. "We wish we could have done more," said Ashley Theres. When Theres drove up on the accident she and another woman didn't hesitate to help. "We both checked for a pulse and immediately dropped to the ground and just started going," said Theres. Witnesses said a group of motorcyclists got on I-794 North at Oklahoma around 10 p.m. Wednesday. The Sheriff's Office said two people were thrown from a bike when they hit the median. "All I could think was please wake up, it was very emotional," said Theres. Theres, certified in CPR and first aid for 20 years, didn't even have time to think. "Almost as if not aware of anything else happening or how scary it could be just focused on what I'd learned and just kept going," said Theres. Theres has a message for the victim's family. "My heart definitely goes out to you I'm very sorry for your loss and know that we tried our hardest," she said. Thirty-nine-year-old Jason Tiller, who goes by Red, and 38-year-old Shameka Calhoun died in the accident. Calhoun's younger sister said her family is in shock. "When I got the phone call I tried to rush right to my sister and I was praying the whole way that she made it," said Breanna Calhoun, victim's sister. Calhoun leaves behind a big family, including four kids of her own. "Every time you seen her she always has a smile on her face she was just a lovable person," said Calhoun. 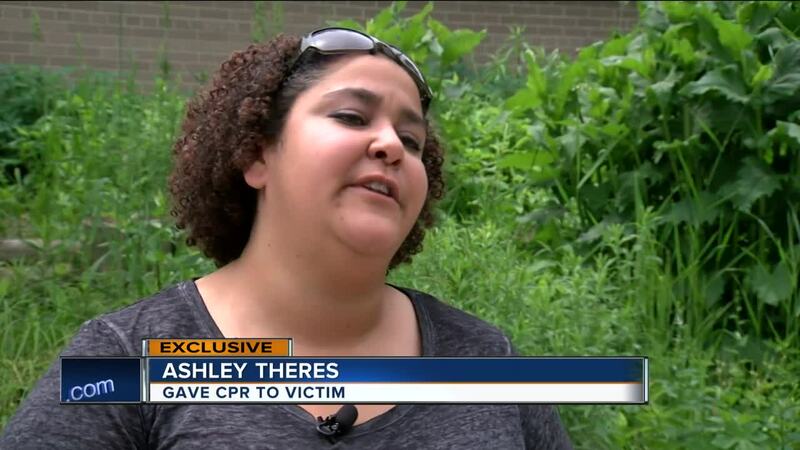 Though this accident ended in tragedy, Theres hopes others will think about getting CPR certified. "Being trained and being ready and able and willing to assist at any time you never know what you're going to happen upon," said Theres. For information about getting CPR certified visit the Red Cross website.